Now, someone informed me that it was not actually a "Crock-pot" but rather a "Slow-cooker"; that crockpot is just a brand name... like Crayola or Band-Aid, but I'm too old for these sorts of sweeping vocabulary changes. I think I'll continue to call it whatever I please. Sautee mushrooms, onion and garlic in the margarine for 3 to 5 minutes, until onions turn soft. Put the mushrooms, onions and garlic in a crock pot and add the broth. Stir the vegan sour cream, the soymilk and flour together until well blended. Add to crockpot quickly, cover and and cook on high for another 30 minutes, or until soup thickens and bubbles on the edges. Add more salt and pepper to taste if needed. **The soup really doesn't have a blue-ish tinge. That's the crappy lighting. Sorry. I'll close with two pictures of my girls. I LOVE these! The weather has been sunny and misty and just beautiful between rain showers today. So the girls took their cousin-dog (their Auntie's dog), a beautiful Doberman named Riddick, out for a long walk in the woods. He's such a sweet pup! oh man, I am soo trying this one! I long for a good cream of mushroom soup! I tried one in v-con but it didn't really float my boat. I am w/ ya on the whole naming thing. My hubby asked if we had any tums I said yes, told them where they were and he came out moaning and groaning about not being able to find them.. well, it was Maalox not tums.. I'm w/ ya whatever. This looks great, I've been thinking about making a creamy mushroom soup and this so looks great AND it's made in the crockpot. What could be better? I have to try this! What a yummy sounding cream of mushroom soup. I wouldn't have thought of doing it in the slow cooker/Crock Pot, but it's an excellent idea. Thanks for sharing! Oh God, I can't wait to try this soup!!!! I used to eat cream of mushroom soup by the boatload! Hi Marti, I am going to make this, however, a question or two. Having this cook in a crock-pot for 6-8 hrs seem like the mushrooms/onions/leeks would be mushy..I rather like crunch..could I maybe cook it for less time? Say maybe 3-4 hours, what is the reasoning behind 6-8 hours? Also I am going to use Almond milk instead of Soy milk, I'm sure that will work okay, right? This is my standby soup! 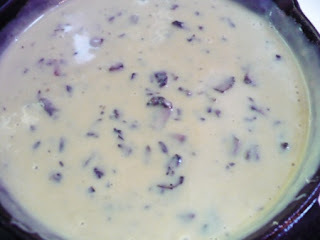 I made it for the first time last year as i was trying all kinds of new recipes I didnt get to commenting about this one, my 94 yr old grandma said it was the best cream of mushroom she ever had and couldnt believe it was vegan! making it again this year for vegan green bean casserole. thank you for a great recipe!